If you enjoyed this item, please consider sharing it! Our featured product is the JW-01. We are the sole distributor of this U.S.A. made digital, wireless system which connects your guitar to an amp or iPhone so you can listen to your music through your home stereo system wirelessly! 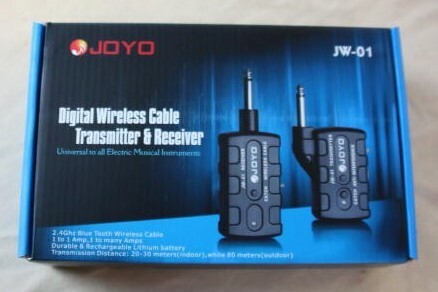 It uses Bluetooth technology and allows you to attach 8 instruments to 1 amp. You can also hook up a headset since the transmitter has an input with a separate volume control unit. Play your guitar and sing at the same time through your amp without cables. List price is only $169.00, and they run off an internal lithium ion battery that charges in 1-2 hours for six hours of use.